That can only mean two things. Less than a month until football starts and, at long last, the third annual SportsChump over/under contest has finally arrived!!! Everyone’s favorite contest of the year has met with rousing support in the past and promises to again in 2013, so put on your thinking caps, people, and pick me some winners. The rules are the same as they’ve been in the past. An NFL future is how many wins, out of a 16-game season, Las Vegas thinks each team will tally. You are to choose over, or under, that number. Ties will go to the runner. You must select TEN TEAMS from the list below and assign them confidence points, ten being the team you’re MOST confident about and one being the least, then list them in the comments section. You will be awarded those points if you correctly guess over or under for that particular team. It’s just that simple. For the tiebreaker, I need your projected win total for the three Florida teams: Tampa Bay, Jacksonville and Miami. This year, I’m going to give you a head start by doing something for you other sports websites won’t. 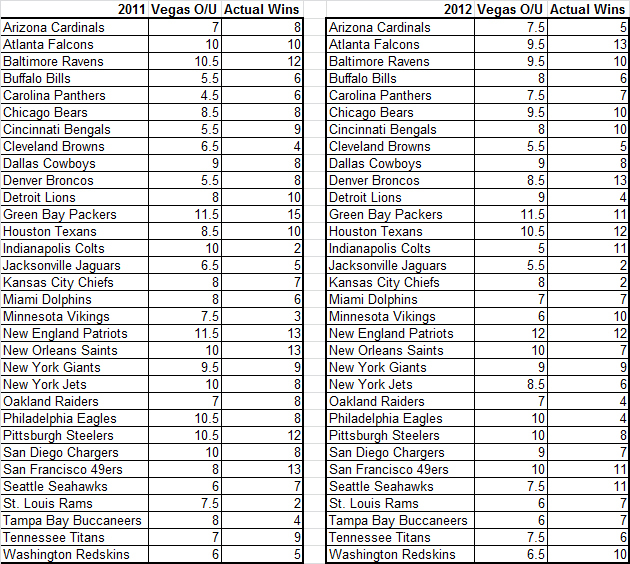 In addition to this year’s projected totals, below you will also find Las Vegas’ over/unders and actual win totals for 2011 and 2012 for you to use in making your selections. Just remember that history will teach us nothing. Once again, this year’s contest winner will not only receive bragging rights and a fabulous prize pack (including the Library of Congress’ soon to be released Football Nation) but a seat next to Hanahan and Ravenous in the SportsChump NFL Pick ‘Em Hall of Fame. All entries must be received by kick-off of the opening game September 5. 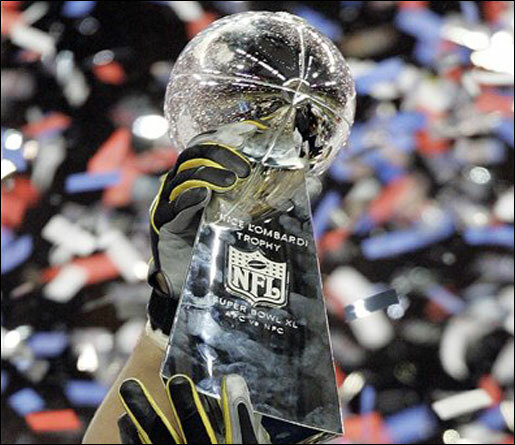 This entry was posted in Featured, Pigskin and tagged Las Vegas, NFL, NFL Futures Contest by Chris Humpherys. Bookmark the permalink. And before we continue, I’d like to announce the winners of some previous contests. Both these gentlemen kept their answers short and sweet, proving once again that “fewest words possible” is a credo to live by. Aero won our Hate the Heat contest and picked himself up a copy of Craig Carton’s “Loudmouth” and Bleed conquered my Gary Player caption contest and won himself a stylish SportsChump t-shirt. I’m assuming I’ll have to order a XXXL for the occasion. Gentlemen, please e-mail me your snail mail addresses and I’ll have my secretary drop these well-deserved prizes off at the post office at her earliest convenience. Dwin is officially in. I just need your tiebreaker, sir. Nice to see he hasn’t lost his touch for football just by moving West. And all his marbles on the Browns over 6.5? I take that back. Maybe he HAS lost his touch for football. The Beag is also in. Must be a slow week for NASCAR. I will say she’s got some interesting picks by selecting all the favored teams (Denver, Pats, Niners, Texans, Saints, Giants, Packers) to finish OVER their projected number. You’d have to assume at least one of them would up for a letdown, no? Heavy D is also in, officially giving us three entries… and also officially giving us three under votes for the Dallas Cowboys. Yeah, Beag, from a distant observer, the whole Stewart thing was an interesting case study. If an NBA or NFL player gets caught riding a motorcycle or skydiving in their spare time, and that activity results in injury, their entire contract can be voided. I guess since Tony Stewart is what, self-employed? Owns the race team? the only person that can penalize him for his actions is himself. 15 wins for his tiebreak and Dwin is in. Goodness, that’d make for a sad, sad football year for Florida. For what it is worth , here are my picks . Broncos` Vonn Miller gets a six game suspension rater than the mandatory 4 game suspension . Was his idiocy actually worth it ? As a rookie, prior to even having played his first game in the NFL , he failed a drug test . As usual, there’s a problem with your entry. I’m assuming this is what you meant? And did you want most of your confidence points on Atlanta or Jacksonville? PY from the movement is in with some pretty interesting picks. Down year to Pittsburgh, another solid year for Indy and Both Arizona and Tennessee predicted at under 5.5 wins. Is it possible that both those teams can be that bad? Mo from Fan on Fire is in, giving us six entries so far. Mo took eight overs. Hmmmmmm. I wonder. At first glance, I like your picks. I would have gone so far as to call you an early favorite to win this thing… until I saw you picking the Buccaneers over, he he. Spot on ! Atlanta . Teams are a bit more balanced this year than last year, but here are BS’ picks. Thanks for the invite again. Oops, almost forgot the tiebreaker. 19. Aero is in giving us eight, working on CDR/BS right now. Aer, not sure if you read the comments section above but email me your address and I’ll get that book out in the mail to you if you like. Oh, and we’ll see if that Bucs pick costs ya’. The Surface is also officially in, giving us nine entries without mine. On a side note, I can’t imagine what it must be like to be a Cleveland Browns fan with your annual over/under number being low and everyone and their mother thinking your team will finish even below that number. XXXL? Damn. Either you meant hat size or took my rant on competitive eating to heart. Sorry to disappoint, but I don’t even crack 185lbs and still play basketball 3 times a week despite the torn ACL a couple years ago. Whatever… A win’s a win, T me up, Chump. Bleed is in, expecting more of the same. Good teams staying good (Atlanta, Houston, San Fran, New Orleans) and bad teams (Jets, Jags, Raiders, Bills) staying bad. Doesn’t leave much room for surprise, does it? Need I remind everyone that he is our defending champion and won last year by getting nine of ten teams correct. I’m low-balling my tiebreak as I don’t expect much from any of the three Florida teams. 16 wins is my tiebreak. KSP and Joey are both in, giving us 14 participants so far with a week to go. Early thoughts on the picks. Lots of Jets under, lots of Steelers also under. And not too many of us see a drop off for either San Fran or Seattle. Nor do any of us see the three Florida teams winning more than a combined 21 games. Alright, all you guys, and gals, competing for 2nd place, let’s keep it clean out there. There can only be one winner… no hate. The once and future champ is here! Yaz and Han both in under the wire. I find Yaz’s Giants bet intriguing. Pretty much everyone has stayed away from them, maybe only four people so far have even touched ’em, and Yaz puts his full ten on them over? Does he know something we don’t? Or is he just not paying attention. Han, you ready for Florida-Miami? Bipper and Dee Dee both in under the wire giving us 18 to go. Best of luck to everyone and happy football season.